Elastic Waves in the Earth provides information on the relationship between seismology and geophysics and their general aspects. The book offers elastodynamic equations and derivative equations that can be used in the propagation of elastic waves. It also covers major topics in detail, such as the fundamentals of elastodynamics; the Lamb's problem, which includes the Cagniard-de Hoop theory; rays and modes in a radially inhomogeneous earth and in multilayered media, which includes the Thomson-Haskell theory; the elastic wave dissipation; the seismic source and noise; and the seismographs. The book consists of 33 chapters. 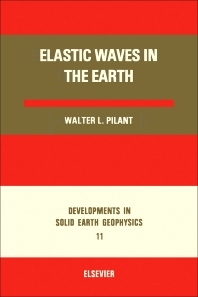 The first 16 chapters include basic material related to the propagation of elastic waves. Topics covered by these chapters include scalars, vectors, and tensors in cartesian coordinates, stress and strain analysis, equations of elasticity and motion, plane waves, Rayleigh waves, plane-wave theory, and fluid-fluid and solid-solid interfaces. The second half of the book covers various ray and mode theories, elastic wave dissipation, and the observations and theories of seismic source and seismic noise. It concludes by discussing earthquake seismology and different seismographs, like the pendulum seismometer and the strain seismometer.